Are you a maverick soul? Not everyone conforms to tradition. I don't, and neither do many of you. Here's the thing: being a rogue soul can often make you feel isolated. If you're not one to follow the leader, can you still find a tribe? And can you find your own way to happiness, fulfillment, and spiritual stability? Yes! And that's what this blog is all about. Join a movement and discover what it means to be a Maverick Soul! Even rogue souls need a community to come home to. I am a yoga studio owner, yoga teacher, perpetual student, television sports producer and writer. I love Boston sports, street art, words and communication on all levels! I try to define myself not by what I do but who I am striving to be. 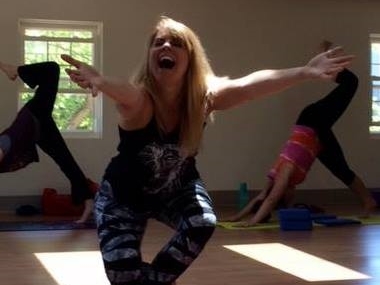 Laughing Elephant Yoga is my OM away from home. Catch me for classes or just pop by and say hello! My photo gallery is the chronicle of my adventures. Come along for the ride! Thank you! I'll respond to your e-mail as soon as possible - usually within 24-48 hours.